If you've been reading this blog or following me on Instagram for the past year or so, you'll know that I'm a big, big fan of Straight Stitch Design patterns. In fact, it just showed up in my Timehop that a year ago, I was showing off the Wedgwood skirt I tested for Kimberly! Today, I'm showing yet another awesome pattern (well, really 3 of her patterns if you want to get technical, but keep reading for that! ;)) that was just released yesterday, and I had the chance to test for her again! This is the Phinney Ridge Cardigan pattern, you can grab a copy here for a fantastic discounted price through Friday, in celebration of the release. I am such a big cardigan wearer, in fact, I'm wearing a RTW one right now that has seen better days, because, constant wear. This pattern is such a great alternative to my fave RTW style that I'm wearing at the moment, I am SO excited about this, because now I can fill my closet with all the me-made versions!! 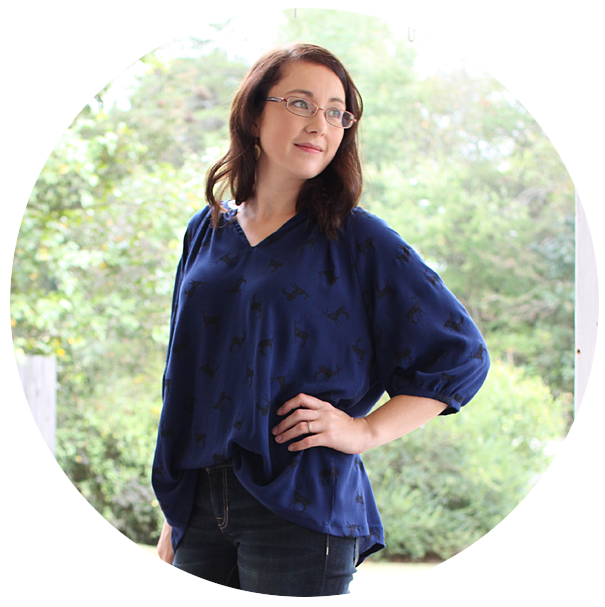 This pattern features a v-neck, with button closure (or you can of course use snaps, or even leave off the closures all together if you want! ), long or 3/4 sleeve options, and elbow patches if you want to add more detail! There are also instructions included for shortening or lengthening the pattern to your desired length if you need them. 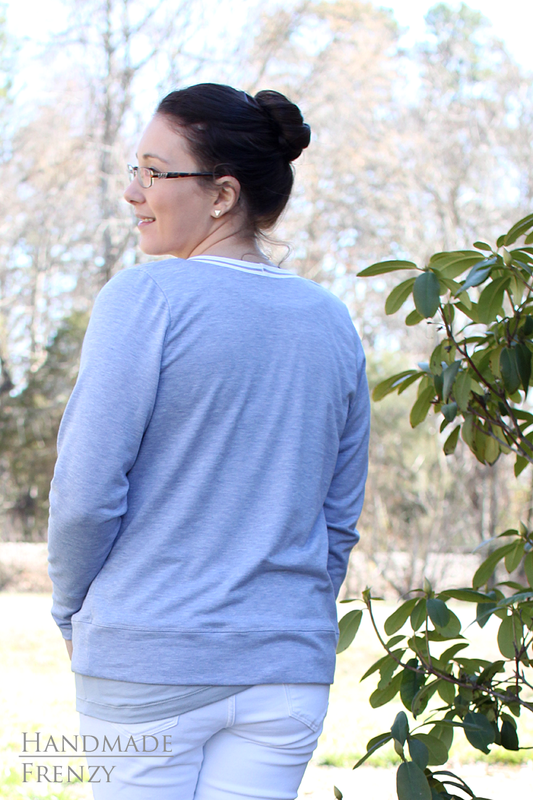 To get this length for my tester version, I used a french terry fabric and shortened 1.5" to hit at mid hip. 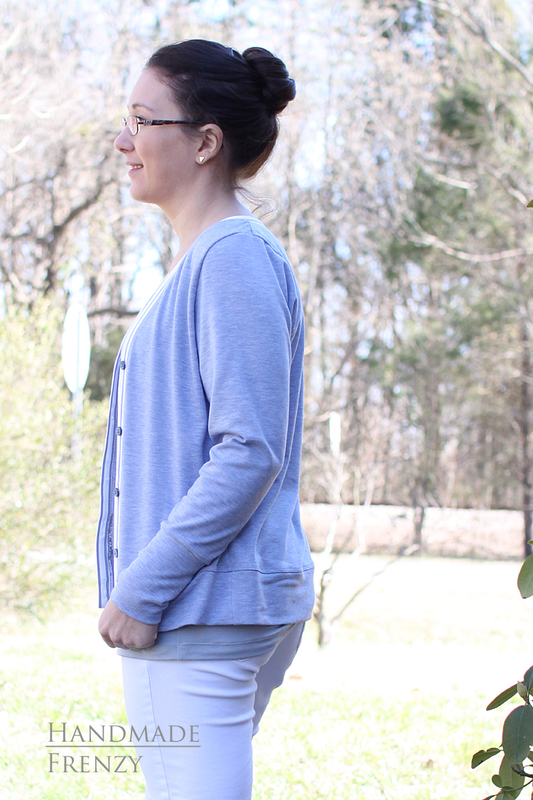 I think this would be a fun cardi to wear with the Wedgwood Skirt and could be shortened even further to flatter the natural waist fit of the skirt. I'm definitely going to need to do just that! And also make one in every color under the sun and with all the sweater knits... Basically I need at least a dozen of these, amiright? 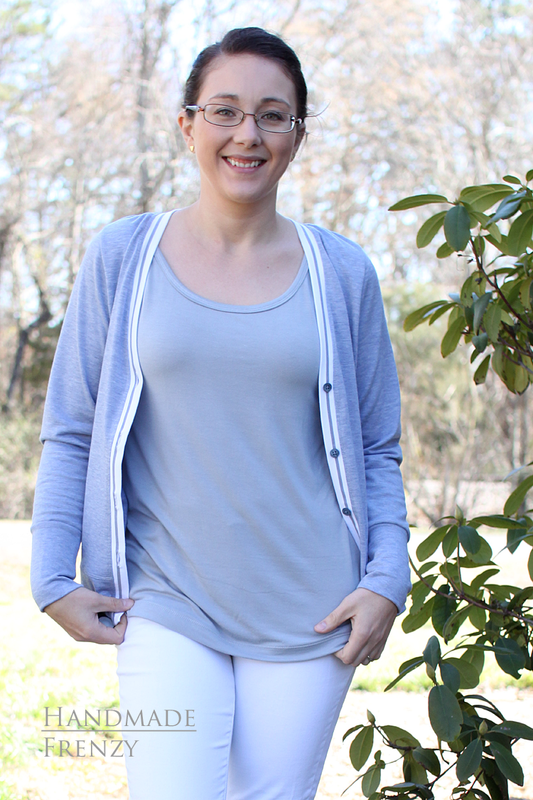 For this version, I used a lightweight rayon french terry from LA Finch Fabrics (also used here). It is the most comfortable fabric to wear!! I didn't have quite enough for the button band, but that worked in my favor, because I got to use my favorite thing ever, stripes! The stripe fabric is 4-way stretch jersey in Club Stripes from Raspberry Creek Fabrics. Because I'm just that kind of crazy, I had to make a perfectly coordinating tank to wear under the cardigan. I decided to go all SSD and made a mash-up of the Greenwood tank and the Montlake tee. All I did was cut out the top portion of the Greenwood and laid my modified Montlake pattern over top of the Greenwood pattern and cut out the bodice with it. I used an absolutely scrumptious J.Crew knit from Imagine Gnats. I've had this fabric in my stash for a while, waiting for the perfect project, and now I think I need this tank in all of the colors to go with all of my future Phinney Ridge cardis. Lol. If only I had as much sewing time in reality as I do in my head. If I haven't convinced you yet that you need this pattern in your life, be sure to check out the tester roundup posts Kimberly has on her blog today! There are so many great versions in a variety of different fabrics! Made straight size 6, shortened 1.5"
What a great cardigan, it looks great on and the stripes are fab, I'll definitely check out this pattern. I think you already know how much I love your version!! (At least, I HOPE you do because this is so awesome!) Stripes always make everything better <3 And that Greenwood tank is perfect with it!